If you’re in an area that isn’t prone to weather catastrophes know that you’re not yet out of the woods and call our water damage Fort Worth Team at 911 Restoration Fort Worth for a free inspection today. Our water damage Saginaw team is licensed, bonded and insured for all categories of water. 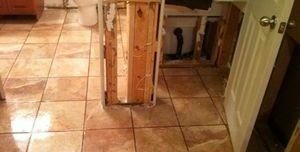 Our water damage Saginaw team’s years of experience in the water damage restoration business has shown us that water damage that begins from within the home is quite common, as old pipes can burst or washer hoses can rupture at a moment’s notice. We’ll arrive in minutes of your call for any of the common issues listed above so that black water and mold does not become an issue. And if you already have mold, our water damage Saginaw team also specializes in mold remediation as well so no matter what 911 Restoration has you covered. Call us today and let us come out and give you a free inspection because nobody enjoys an unexpected pipe burst flooding their living room, so don’t wait and call now! Pipe bursts in Saginaw are extremely common as many of the homes in the area have old plumbing and cast iron pipes, so if you experience a burst pipe in your Fort Worth area home the first thing you should do is turn off your water to turn your home, then contact our water damage Saginaw team which is available 24/7/365 same day service. We are experts in pipe bursts, burst pipes and plumbing repairs in the Saginaw area and will speed over to your residence within 45 minutes or less. All of our water damage Saginaw technicians carry state of the art tools and technology like special water removal and drying equipment that is guaranteed to eliminate all water damage from your flooded home fast. Fast action is the best way to ensure that mold doesn’t grow, structural failure doesn’t occur and your water damage insurance claim doesn’t get denied. Speed, professionalism and customer service are three things you want and need from a restoration company and that is what you get at 911 Restoration, so for the best in the business contact our water damage Saginaw professionals now! At 911 Restoration Fort Worth our water damage Saginaw team works extra hard to prepare the homes in the area for unexpected water damage before it strikes, and that combined with our industry-leading speed makes us the absolute best choice for water restoration service in the city of Saginaw. Our free inspections and 45-minute response time always means that minor water damage stays exactly that, minor. Additionally because we help prepare homeowners and their homes for emergencies through preventive maintenance assistance and insurance coverage recommendations, restoration costs are always affordable when you use 911 Restoration for water removal solutions. Saginaw means “to flow out” and is named after a river and even though there isn’t a local body of water surrounding the city, we know from almost four decades in the industry that water damage can still happen any time, any place. For the company that will keep excess water from flowing inside your Fort Worth area home, contact our water damage Saginaw team with 911 Restoration Fort Worth today!